You can easily raise charges against your bookings and then send a notification to the customer. 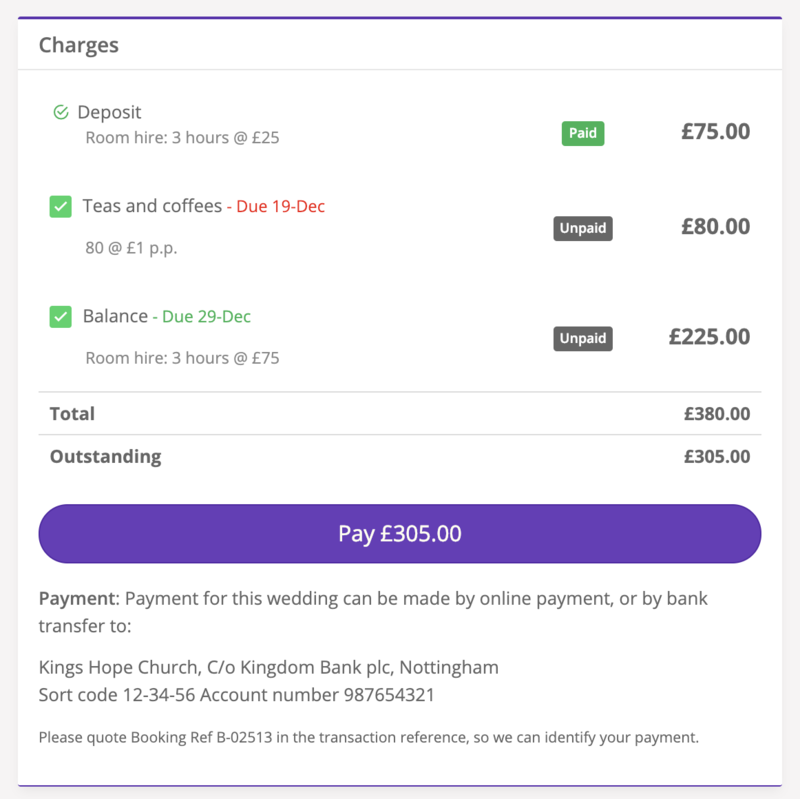 Using your existing Stripe integration, you can also receive online payments for booking charges, providing customers and churches a simple, secure and efficient means of managing payments. You can even record manual payments received by other methods like cash, cheque and BACS. We even help you keep track of all the charges that are due for payment, highlighting overdue charges so you can chase them up! This functionality will suit both larger conferencing venues with complex bookings and smaller venues that simply hire out their church or rooms for weddings and parties. Booking charges can be raised against sequence bookings and stand alone bookings for a single date. For sequence bookings, charges are raised against the sequence. In this way you have lots of flexibility about the frequency of charges raised within a sequence - so you can raise charges weekly, monthly, quarterly, or for the entire sequence, if you wish. You can raise multiple charges against each booking or sequence, perhaps for deposits, instalments, extras or full charges. 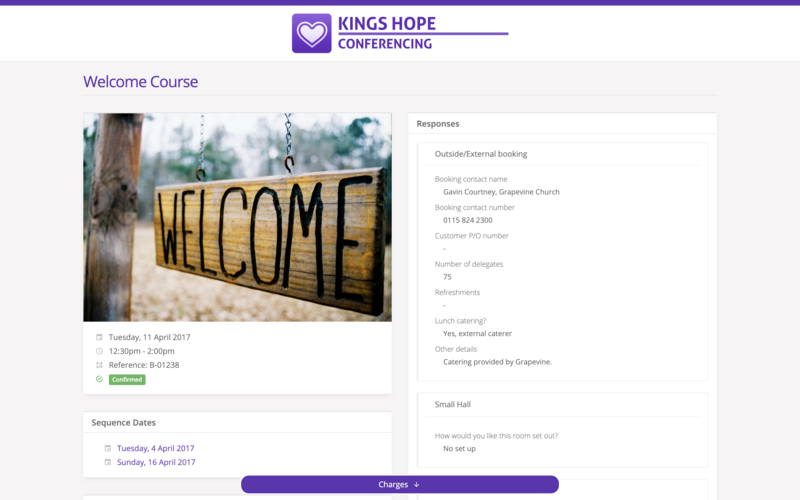 For each booking Type you can optionally create a Brand to match your booking and conferencing styling, which may be different to your other church ministries. Custom brands show in the customer-facing Booking Page your customers can see and also in your branded email booking communications. For each booking Type you can set whether online payments are enabled by default, so you can disable online payments by default for your internal-facing booking types where charges are not relevant, but enable them by default for your external, commercial bookings, if you wish. 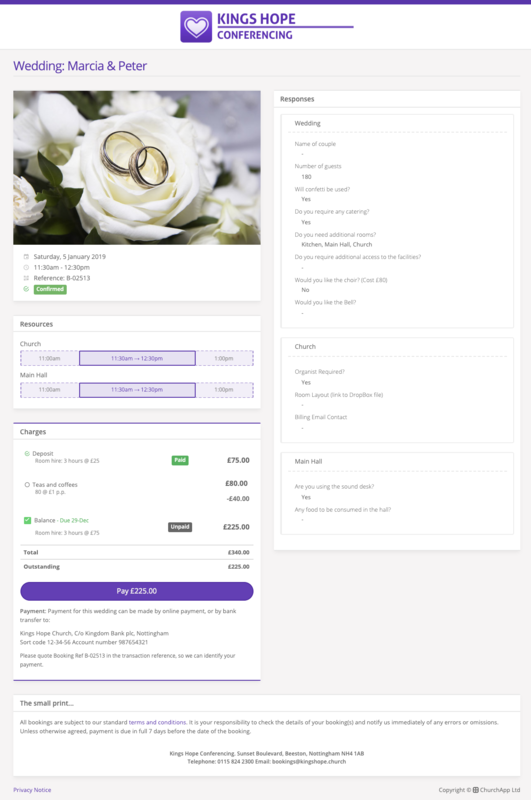 You can even add type-specific payment instructions - for example, if wedding bookings are paid to a different bank account to your other bookings. To help manage all the various booking customers you may have for a particular organisation, you can group customers together by Company and specify the job title of each customer within that company. The customer page helpfully lists all the customers At this company, so you can quickly switch to a different customers within the same company. You can also add internal Notes against bookings - notes are not visible on the customer-facing booking page sent to customers. 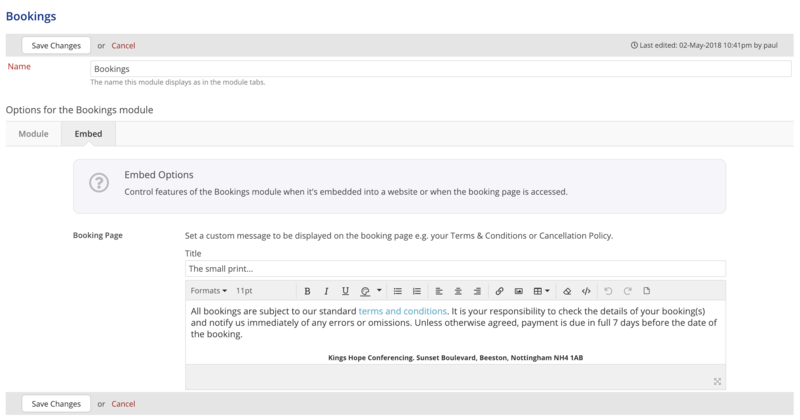 In the Bookings module's settings there are Embed options to add a custom message that will display on all your customer-facing Booking Pages, which will be visible to customers when they access the page - ideal for giving details of your terms and conditions, cancellation policy or your admin address and contact details. For each booking charge raised, specify the charge Name and Description, an optional Invoice number, and the Amount and the Due Date. You can also set whether the charge is to be Visible; hidden charges do not show on the booking page until set visible. 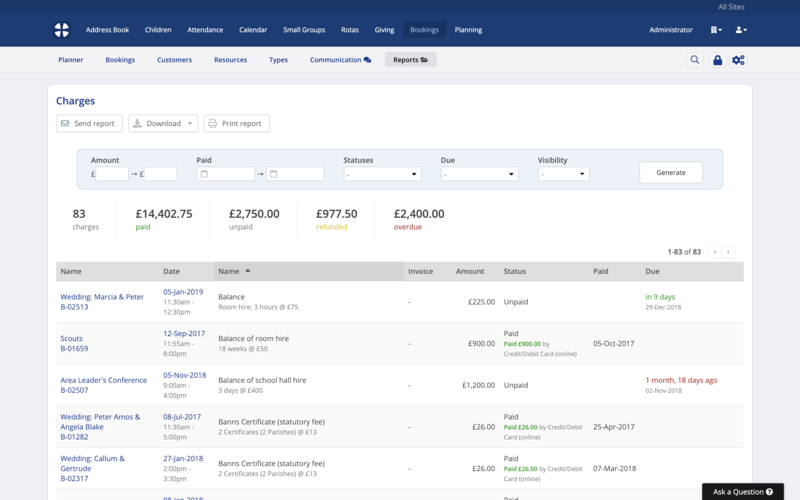 ChurchSuite will help you manage the payment status of your charges, so you can easily see charges that are due, overdue, refunded and partially refunded. While online charge payments automatically update the charge's payment status to "paid", you can also manually manage other payment methods and set a charge as Paid and enter the payment Method; ideal for recording payments received by cash, cheque and bank transfer (BACS). When viewing a booking you'll see a table of all Charges for the booking sequence. From here you can easily Add, Edit, Duplicate or Remove a charge. The View history option on the Charges table provides a helpful audit trail of all charges, payments and communications related to the booking sequence. Each booking sequence has its own unique Booking Page that can be sent by email to the customer as a booking confirmation. In this way you can easily communicate variations of terms of hire and send requests for payments. Whenever a customer views their booking page they'll always see the latest booking details, including charges. The customer-facing Booking Page shows all dates in the booking sequence, the booking details, charges and payment details, and the responses to all booking type and resource questions. When configuring booking types and resources, you can set whether question responses are visible or hidden on the booking page sent to customers, meaning that you can hide internal-use questions that are not relevant to the customer but are relevant to your bookings team. Note, the Booking Charges functionality is not intended to be a replacement for your church's existing accounting or finance systems that you already use for invoicing purposes. An optional invoice number field is provided for cross-referencing each booking charge in ChurchSuite to your paper invoices and/or accounting system. 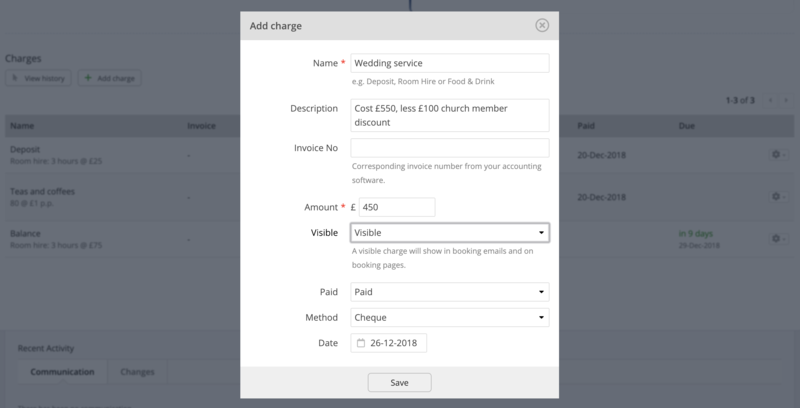 The Bookings module reports include a number of customer and booking charge-related reports to help churches manage and report on bookings, customers and charges. 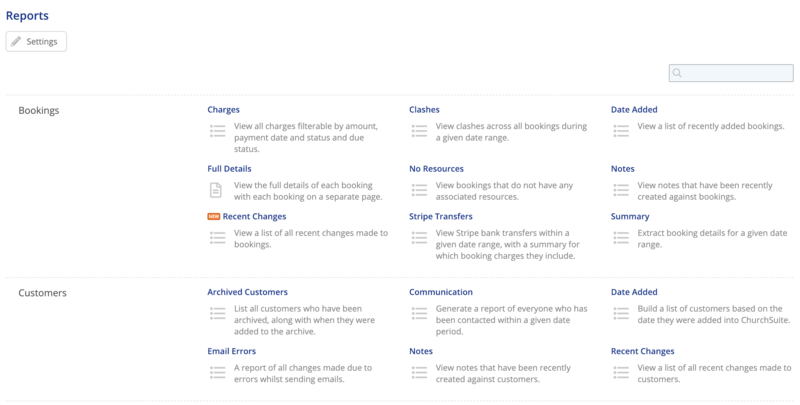 When viewed from within the Bookings module, the Stripe Transfers report shows a detailed breakdown of online payments received in respect of booking charges. There is very little configuration required to begin raising booking charges and processing payments received from customers. You'll get the most from the functionality by following these simple suggested configuration steps. Begin by ensuring the Booking Charges feature has been enabled in the Bookings module's options - scroll down the Module Options page and select to Enable booking charges. 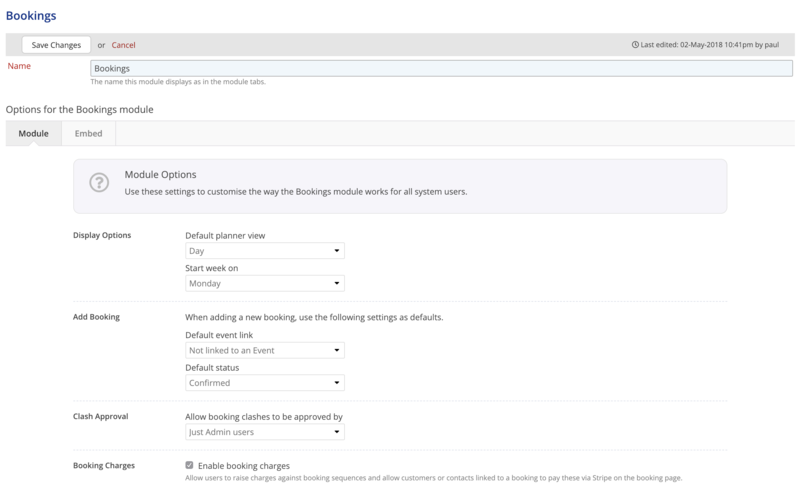 Within the Bookings module's options is the Embed section where you can optionally set a custom message that is shown at the bottom of the booking pages that your customers will see. For example, this message could be used to set out your terms and conditions, cancellation policy, payment terms and your church address and contact details. Remember to save your changes before navigating away from the module settings. If you wish to provide customers with the option to pay their booking charges online then, if not already done so, you will need to complete the Stripe integration (Administrator > Integrations). See the related support article at the end of this article for further details. You may already have a Stripe integration completed for event ticket payments and online donations - if so, no further changes are required to receive booking payments. UK churches: Stripe is the payment provider ChurchSuite uses for all card payments. For eligible non-profit organisations, one-off and recurring card payments accepted through ChurchSuite via Stripe are subject to a 2.2% + 20p (no cap) transaction fee for European cards, and 3.9% +20p for non-European cards. This transaction fee consists of two parts - a 1.2% + 20p transaction fee to Stripe and a 1% transaction fee to ChurchSuite. For more information click here. Standard Stripe accounts - for organisations not registered as non-profit - are subject to a 2.4% + 20p transaction fee. Transactions fees are deducted by Stripe from the gross payment, with the 'net of fees' amount deposited in your church's designated bank account. Stripe payout card payments to your bank account in batches, at a frequency set in your Stripe account settings. ChurchSuite's Stripe Transfers report will help you reconcile those batch transfers and give you information about the gross payments, transactions fees and net payments and total received. Non-profit discount for North American churches: US & Canadian churches that are eligible non-profit organisations are able to access a special charity rate of and 2.9% + 30c for International and American Express cards) In this case, the transaction fee consists of two parts - a 2.2% + 30c transaction fee to Stripe and a 0.7% transaction fee to ChurchSuite. These fees are among the lowest of any card handler in the world! When you complete your Stripe integration you'll receive an email explaining how to claim these charity rates. To enquire about your eligibility as a non-profit, email nonprofit@stripe.com. For further information about transaction fees in other regions, refer to the Stripe website - remember to add a further 1% in respect of the ChurchSuite processing fee. Fees correct as of 19th March 2019. For churches whose lettings are branded differently to their main church branding, you can optionally set a custom Brand for your different booking Types. Brands are added in Administrator >Brands - see related support article for further details. Once a brand has been added you can assign a brand to a booking type - all bookings for that type will follow that branding. For each booking Type you can also add custom Payment Instructions that show on the customer booking page in the "Charges" section. If you wish to accept online payments for bookings of this Type by default, tick the Payment Enabled checkbox. Note that this option is simply a default setting - you can override this when adding a booking, choosing to disable online payment for individual bookings if you wish. Continuing down the booking Types setup page, you can configure the Payment Confirmation email that will be sent to the booking contact/customer when someone makes an online payment. By default ChurchSuite will always send an online payment confirmation email containing full details of the payment transaction. The payment data shown in the email is in a partially obfuscated format. You can also type a custom payment confirmation email. ChurchSuite will append the payment transaction information to the end of your email. Confirmation emails are logged in the Recent Activity > Communication section for the customer, not the booking. For each of the custom Questions you've added to a booking Type you can optionally set the question's Visibility to determine whether the question and question response should be shown on the customer-facing Booking Page. In this way you can set internal-use questions and responses not visible if you wish - they will only be visible internally when a user is viewing the booking in ChurchSuite. This is especially helpful when you have booking questions that are not relevant to the customer - perhaps only relevant to your bookings team, caretaker, or overseers for that booking Type. ...and set the Visibility to Visible or Hidden as appropriate. Repeat for each of your booking Types as appropriate. As with booking Types, there are optional settings that you can configure for each of your Resources. From the list of Resources in the Bookings module, select a resource and click View from the action cog on the right-hand side of the list. Scroll down the resource page to the Questions section. For each of the custom questions you've added to a booking Resource you can optionally set the question's Visibility to determine whether the question and question response should be shown on the customer-facing Booking Page. In this way you can set internal-use questions and responses not visible if you wish - they will only be visible internally when a user is viewing the booking in ChurchSuite. This is especially helpful when you have booking questions that are not relevant to the customer - perhaps only relevant to your bookings team, caretaker, or overseers for that Resource. Repeat for each of your Resources as appropriate. To accept online payments for booking charges, the Stripe integration must first be completed (see earlier), and the Enable payment box must be checked, otherwise the "Pay" button will not be visible to customers when they view their customer-facing Booking Page that you will send them. The "Pay" button will also only be visible on the customer-facing booking page if there are unpaid, visible charges, otherwise the button is hidden. Charges are added against a booking on the booking page in the Bookings module. Click to open and view a booking. Scroll down the page to the Charges table. The table is always visible, even if there are not any charges added yet. To add a charge for a booking, click Add charge and complete the information requested. Negative amounts are permissible and will be treated as refunds - see next section on "Refunds". By default all charges are Visible in booking emails and on customer-facing booking pages, but note the Visibility option to set a charge as hidden, perhaps hiding a charge until it is approved by the customer, at which point you can edit the charge and set it visible. 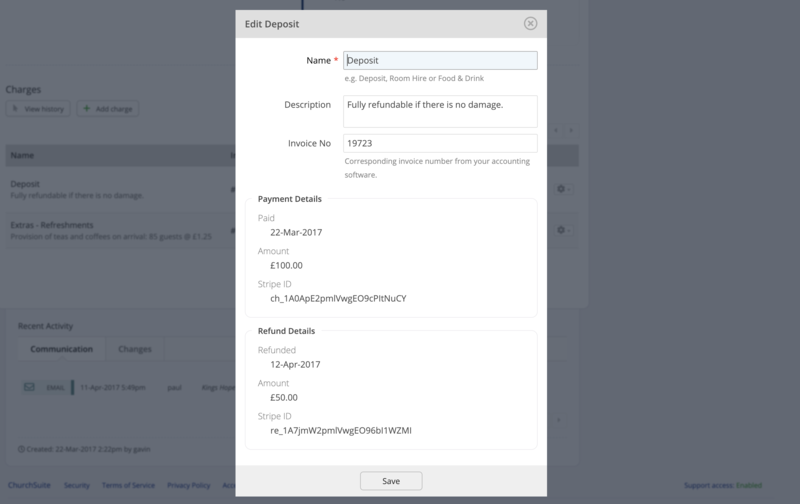 Adding an optional Due date for a charge will help churches with managing and reporting of 'due' and 'overdue' charges. While online payments for charges will automatically mark charges with a Paid status, you can also manage manual payments by other methods at any time. Change the charge status from Unpaid to Paid. This will reveal the payment Method and payment Date fields. Set these as appropriate and save your changes. Note that it's not possible to process partial payments of charges - instead, create separate charges for the partially-paid and unpaid elements. The Charges table lists each charge and clearly distinguishes charges that are paid and unpaid. For sequence bookings, this same table of charges will show when viewing any booking within the sequence. The Charges table is also shown on the customer-facing Booking Page. Again, for sequence bookings, the same table of charges will show on each booking page in the sequence. Finally, it's also possible to duplicate an existing charge within a booking, making it quicker to add similar charges to the same booking/sequence - simply select Duplicate from the cog actions menu on the right-hand side of the charges list. While a booking contact can be either a Customer from your Bookings module or a Contact from your Address Book, you can easily create a customer from a contact - ideal if you're likely to be taking repeat bookings from that contact. Select Add customer from the action cog next to Contact name on the booking page. The option is only available for contacts of 'pay' bookings and is only visible once a booking charge has been added to the booking. 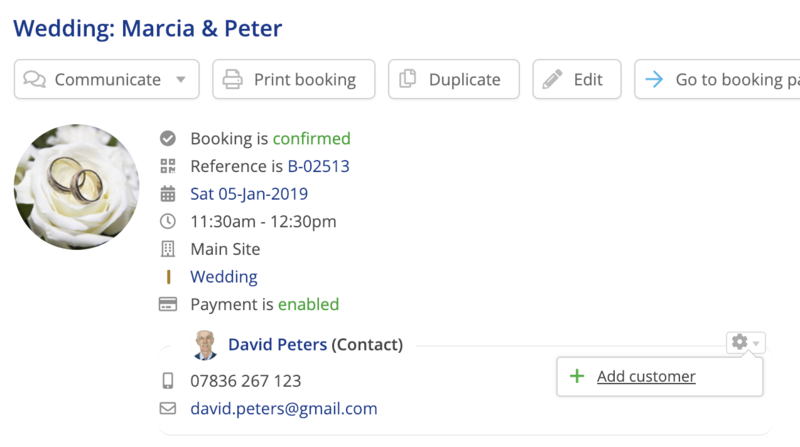 When adding the contact as a customer, if ChurchSuite detects other bookings for the same contact, you will have the option of updating the booking contact for all selected bookings to the newly created customer. When payment for a booking charge is submitted online through Stripe, it's possible to raise a full or partial refund for that payment. From the charges table, select Refund from the cog action menu on the right-hand side of the list of charges. On the Refund payment modal that opens, select whether a Full or Partial refund (specify the amount) is to be processed. Confirm the refund and click Refund Payment. The payment is refunded back to the card originally used to pay (even if that card has subsequently expired). It is not possible to refund to a different card. The refund is then shown in the Charges table and the charge is locked, preventing the payment status from being further edited or the charge being deleted, although it is still possible to edit the charge to modify the charge Name, Description and Invoice No. The refund is also shown in the charge history - click the View history button on the Charges table. It's also possible to enter a refund manually, perhaps for charges that have not been paid online through Stripe that you are refunding by another method. A manual refund is done by adding a negative charge Amount. The payment status is updated to Refunded and the charge is locked to prevent subsequent deletion, although the other refund details can still be edited further if needed. Only unpaid charges can be deleted from a booking. To delete an unpaid charge, select Delete from the cog actions menu on the right-hand side of the list of charges. While it is possible to edit most paid charges and set them as unpaid in order to delete them, once a charge has a Stripe payment against it the payment status is set to Paid and it is not possible to later edit the payment status back to "unpaid", and neither can the charge be removed. However, it is possible to refund online payments for charges - see previous section on "Handling refunds". 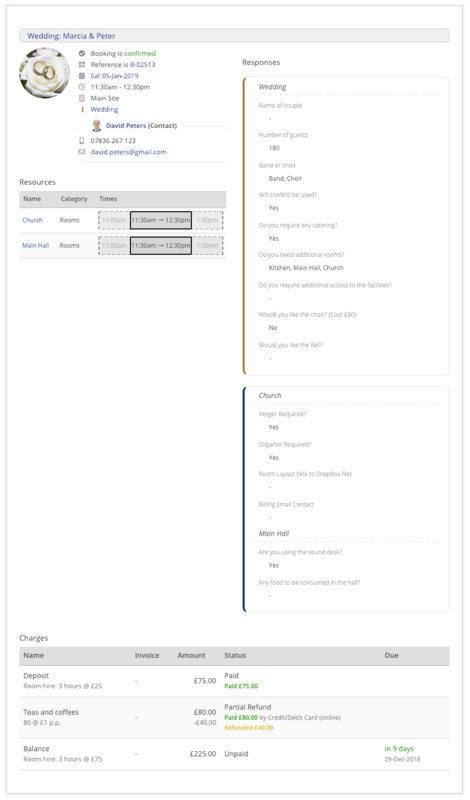 For each booking, ChurchSuite creates a unique booking page. For booking sequences, the same booking page covers all dates in the sequence. If a date is added to a sequence, the added date becomes part of the sequence's booking page. When viewing a booking in ChurchSuite click the Go to booking page button to view the customer-facing booking page in a new browser tab.The URL for a booking page can be embedded as a link in your customer communications if you wish. It's also possible to send a booking page to a customer. The booking page is a customer-facing page that your customers can access to view all the details of their booking(s) - essentially it's their booking confirmation, although the booking page is considerably more! The booking page follows the Brand you have set for the booking's Type and includes the booking page custom message in the footer (set in the Bookings module's Embed options). Type and Resource questions and responses that have been set visible are included in the booking page, along with all booking details - dates, times, resources and charges. For sequence bookings, all dates in the sequence will be listed. The booking date being viewed is the date at the top of the list. Clicking on any of the other dates in the list will refresh the booking page to show the booking details for that sequence date. 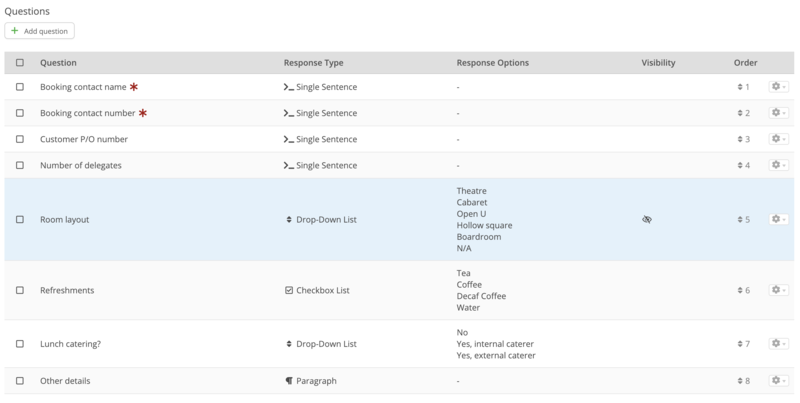 In this way customers can view all the date-specific booking details from the one page, including resource timings and Type and Resource question responses for that date. The same charges table is displayed for each date in the sequence. The "Pay" button will be shown if there are unpaid charges and the booking has online Payment enabled. 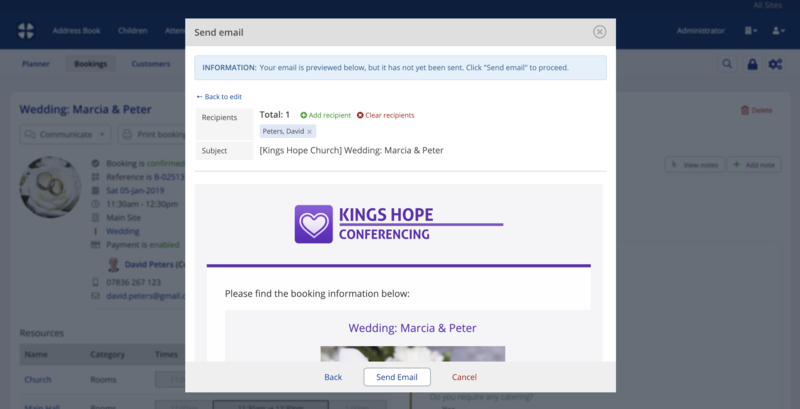 When viewing a booking in ChurchSuite, select Send booking from the Communicate button menu. 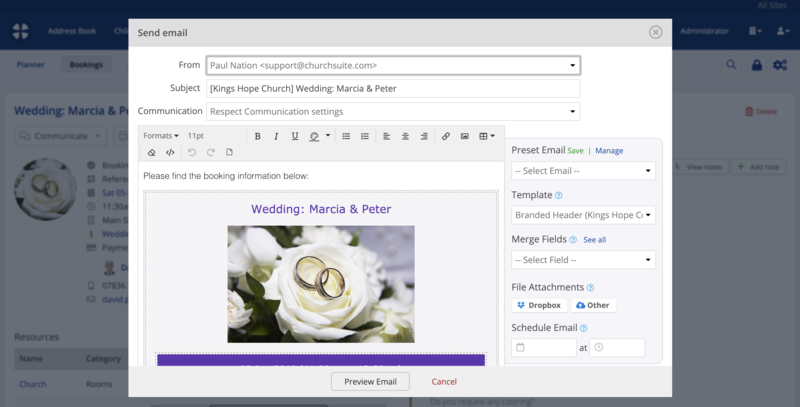 ChurchSuite will not compose a draft email with all the booking details. Set the options to be included in the email. Note that these options only apply to the email that will be sent; the booking page itself will always show all booking details. Click Proceed to continue. The draft booking email is now displayed. The email can be further edited at this point if desired, perhaps to add a personalised message into the email. The email template is pre-selected based on the branding set for the booking's Type. You can optionally attach files e.g. a PDF of your terms and conditions. The email can also be scheduled, rather than sent immediately. Click Preview Email to continue. The finished branded email is previewed, ready for your final review. The customer or booking contact is pre-selected as a recipient, but this can be changed, adding or removing recipients as required. All recipients are always blind-copied. When you are happy with the finished email, click Send Email and your email will be sent/scheduled. 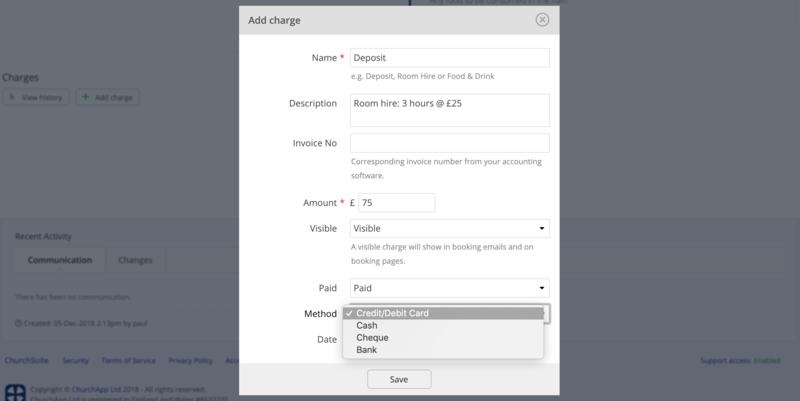 The Booking Charges History (click the View history button on the Charges table) provides a detailed audit trail of all charge-related changes made to a booking or booking sequence, including a log of each time a Send booking email is sent. Clicking +More opens the sent email and open rate email tracking (if supported by the recipient email client) can be viewed. Sent booking communications are also logged in the Recent Activity > Communication section at the bottom of the booking page in ChurchSuite. Note that the communication is only logged against the booking date that the email is generated from, even though the booking may relate to a sequence of dates. However, an identical log is recorded in the Recent Activity > Communication section for the booking contact/customer. All sent booking communications are logged in the Communication report accessible through the Bookings module's reports section. This report can be further filtered to a particular communication method or user. In the Bookings module > Reports section are a number of helpful reports about bookings, customers and charges. Here is a sample of some of the reports that relate to booking charges and refunds. This report lists all your booking charges and refunds, and is filterable by customer/company. Using this report you can filter charges for a range of Amounts, those Paid within a specified date range, charges based on their Status (paid, unpaid, refunded, partially refunded or free), charges that are Due, overdue or pending, and charges based their Visibility. Remember to click Generate after changing the report's filters. The report results columns are also click-sortable. This report is ideal for viewing the full details of all bookings for a given date range. The report can be optionally filtered by Resource, booking Type, and booking Status (confirmed, pending or cancelled). The results of this report is a separate page for each booking within the date range. Note that you can select various options to include in the report. Click Generate after changing the report's filters to update the results. ...and the detail of each bank transfer underneath (example below), showing the booking name, reference, type, the fees deducted from the charges and the net amount deposited in your bank account. Further detail related to each bank transfer can also be found in your Stripe account's control panel.